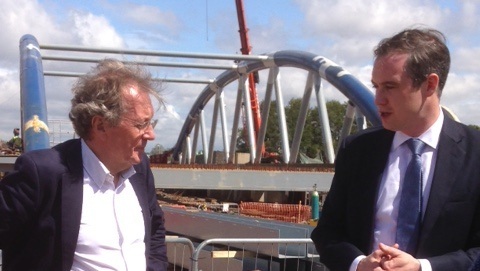 New bridge will open up a world of opportunities for businesses, says Local Growth Minister. A new bridge that will provide a vital life line to the new Arena Island will open up a world of opportunities for businesses, Local Growth Minister James Wharton has said. The minister saw first-hand how the bridge will connect the area to the rest of the city and further boost the Bristol Temple Quarter Enterprise Zone . Once completed the £11.3 million bridge, which is being funded by the government’s Home and Communities Agency, will be one of the key new infrastructure developments in the zone that is supporting local firms. The new bridge will provide vital access to Arena Island – which will house a 12,000 capacity arena for Bristol due to open in 2017 – from Cattle Market Road for cars, bicycles and pedestrians. The site for the arena was transferred to Bristol City Council by the Homes and Communities Agency. Enterprise Zones bring a raft of benefits to businesses including business rate relief, access to superfast broadband and streamlined planning permission to boost local infrastructure. The zones are ensuring that every part of Britain benefits from a growing economy and that everyone who works hard gets the opportunities they need to succeed. Between them, Arena Island and the old Sorting Office are key developments in the Temple Quarter Enterprise Zone, which is one of the largest urban regeneration projects in the UK. Located just behind Bristol Temple Meads train station, these developments will transform the east side of Bristol city centre.